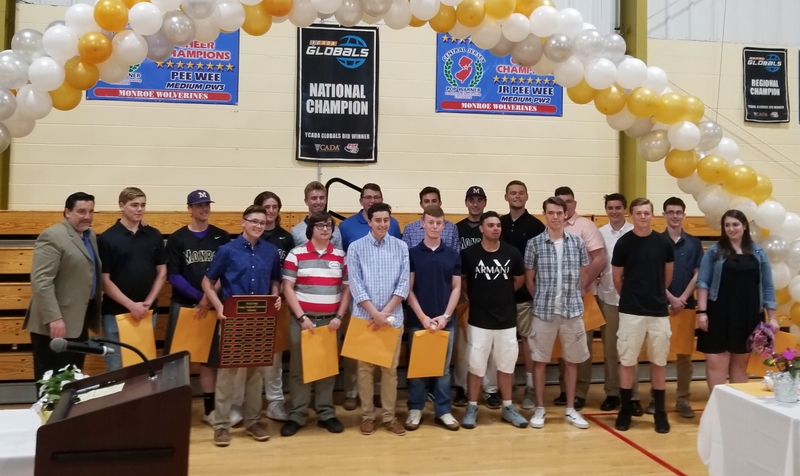 For the 10th consecutive year the Monroe Township Baseball Association will proudly present scholarships to local area High School seniors who plan on continuing their education at a 2- or 4-year college or trade school. If you are a HS senior and were a member of the MTBA (player, umpire, snack bar worker, Buddy Ball volunteer, etc. ), please print out the application packet and fill it out entirely (use the links below to download the form). In addition, the packet was forwarded to the HS guidance departments, athletic directors, and current baseball coaches at the local high schools. The scholarships will be presented at a special ceremony at the Monroe Twp Rec Center in May. On Monday May 21st at the Rec Department Annual Scholarship Dinner, the MTBA proudly presented scholarships to 20 deserving High School Seniors who have been a big part of the MTBA Family. The MTBA is privileged and honored to help contribute to these young men and young woman’s continuing education. This year’s recipients are – Joseph Barravecchio, Brian Belko, Connor Carey, Christopher Church, Michael Dalton, Shawne Eldridge, John Kennedy, Graham Kozak, Chris Krakosky, Jake Lebow, Justin Leff, Kevin Maiolo, Dylan McDermott, Nick Mindiak, Spencer Mochari, Jon Petrow, Dan Sher, Dana Steinberg, Christopher Stepnowski and Matt Zurawiecki. Good luck to all the recipients in the next chapter of your life and continued success in all you do!